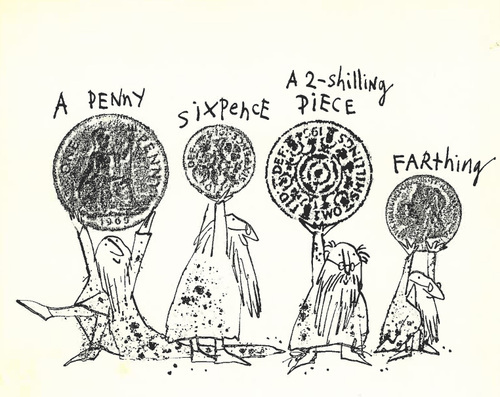 The first US edition of Uncle included this handy explanation of British coins. It features such useful information as "a farthing is so small that it's only used nowadays by the dwarfs." We weren't able to insert it into our edition of Uncle, but I thought I'd share it anyway. If you don't know J.P. Martin's stories about a very rich elephant named Uncle, this will give you a small taste. 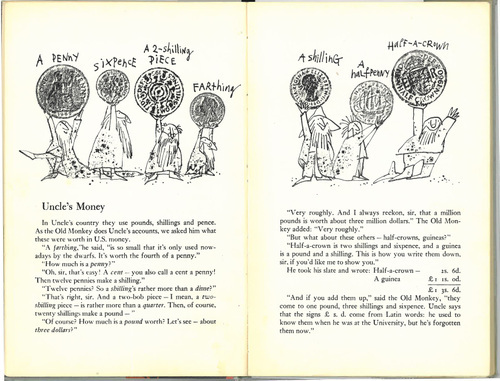 And, if the illustrations look familiar, it's because they're by Quentin Blake, who illustrated most of Roald Dahl's books. Here he's integrated what looks like direct rubbings of the coins into his pen-and-ink art. You might notice a few out-of-date features to this page. First, this complicated system of dividing up the pound was abandoned in 1971. Secondly, a pound is no longer worth about three dollars. And someone should tell Uncle's bookkeeper, Old Monkey, that one million pounds is sadly no longer the equivalent of "roughly three million dollars" either. Here's the whole spread. Click for a larger image of it. Thanks to Uncle and Mr. Blake for explaining the old currency to us. Decimalization made our lives poorer in ways we cannot even remember. I am very pleased that the first volume of the biography of my life by J.P.Martin has been republished. I feel I must point out, however, the factual inaccuracy in your piece. Britain may well have abandoned this 'old' system of coinage but I am pleased to say that we, at Homeward, are proud to continue it's usage. Usage lesson: Oh Snap! Found at MotherSister Brooklyn. The post also informs us that Biz Markie coined this phrase in his song "Just a Friend." But no one compares to Jamey Presley's frequent delivery of it.